Punta de Mita is one of Mexico’s ultra-exclusive resort areas, not dissimilar to the Costalegre, although with Punta de Mita being closer to Puerto Vallarta than the Costalegre, visitors here enjoy easy access to the vibrant and colorful colonial port town of Puerto Vallarta when they want. Punta de Mita is an ideal location to consider if you are looking for a very special get-away or if you are looking for an attractive location for ocean-front property in Mexico. Three of Mexico’s finest and most exclusive resorts, which offer a luxurious vacation experience away from the crowds, are based here; all three resorts are an easy connection from the airport. The most famous is Four Seasons, the only Four Seasons resort in Mexico. The other two are managed by Palladium; one is a resort and spa, the other a ‘royal suites’ property. In addition to being an exclusive vacation area, Punta de Mita is also evolving to become one of Mexico’s most sought-after beach locations for top-shelf real estate investment. There are two mains reasons why this area is emerging as a prime realty investment location in Mexico. The first is the presence of a stunningly beautuful landscape that overlooks some of the most dramatic coastline on Mexico’s Pacific. The second is that Puerto Vallarta, with its international airport, is just 45 minutes away by road. Real estate developers are having a considerable influence on the social landscape of this region. Villages and hamlets which were hitherto off-the-beaten track are now becoming connected by means of new roads and new infrastructure that is being implemented as part of the wider realty developments. Luxury homes are being built in the area and, alongside them, so are golf courses, shopping districts, medical centers and other local amenities. As a result of the significant local investment, the villages in the area are experiencing a new wave of development of their own: prosperity which is feeding through to some of the local communities. Punta de Mita, like Puerto Vallarta and environs, offers you the opportunity to explore around 25 miles of absolutely stunning beaches. Many of the beaches are secluded and can only be accessed by boat. Don’t let this put you off exploring them—cruises and tours are available. See below for details. Some of the beaches are only accessible by car—by driving north or south of the town—because public transport is limited in the area. You may rent a car from Puerto Vallarta to give you more flexibility and independence to explore the area. This region is a water-lover’s paradise. Sailing and SCUBA diving are big pastimes here; and whatever your level of experience, good diving is available. Water-skiing off the bays, parasailing, jet skis, windsurfing, kayaking and more: all of the water sports you enjoy are right here waiting for you in this region. See Also: Water Sports in Mexico. Sports fishing is an important and hugely popular pastime in this area. There are many sports fishing operators working locally who can help you to set up a fishing trip designed around your needs and budget. Excellent spas are available in and around Puerto Vallarta, and the spas at the Fours Seasons and Palladium resorts are among the best you will find in Mexico. For more information about spas, and how to find a magnificent spa experience in Mexico, read our comprehensive guide to Spas in Mexico. A huge range of eco and adventure tours, including whale watching, jungle and tropical tours, mountain biking, hiking, bird watching and trips to the turtle sanctuary and swimming with dolphins are easily accessible from Puerto Vallarta and Punta de Mita. Not only is the climate here ideal for golf, but there is a stunning selection of great golf courses to choose from in Puerto Vallarta. The green next to the Four Seasons resort here in Punta de Mita is one of the best in Mexico. By Air – Punta de Mita is accessible by flying to Puerto Vallarta and taking a 45-60 minute road trip north. Puerto Vallarta’s international airport is extremely well-served by a range of airlines and, being on the north side of the city, is closer to Punta de Mita than Vallarta itself. You can fly to Vallarta from the United States and other points in Mexico including Guadalajara, La Paz, Leon and Mexico City. Ground transportation is available to take you into the center of Puerto Vallarta, the hotel zones and to Punta de Mita. For detailed information about flights and flying, see the Mexperience guide to Air Travel in Mexico. By Bus – Punta de Mita is accessible by bus, although public transport is not as frequent in the local area as it is in other places in the region. Once arrived in Puerto Vallarta, head to the local bus station and look up the schedules for buses to Punta de Mita. For detailed information about bus transportation read the Mexperience guide to Bus Travel in Mexico. 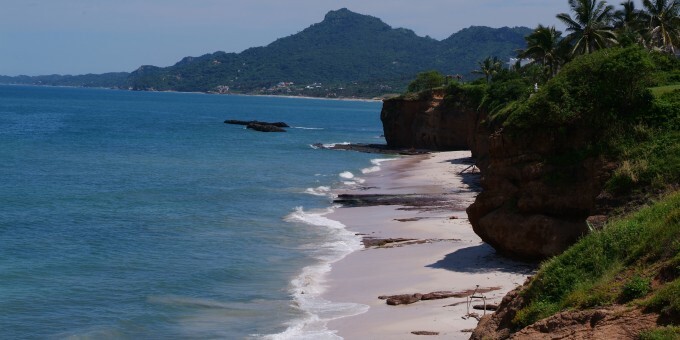 By Car – Punta de Mita is accessible by traveling to Puerto Vallarta and then taking the road out of town (north). The road connecting the two places is good and the journey time between Puerto Vallarta and Punta de Mita is about 45-60 minutes. See additional information about Driving in Mexico and Mexico’s Toll Roads on Mexperience. Car Rental – There are some stunning places that can be explored along the coastal roads in this area, and renting a car locally is ideal and effective way to experience them. A rental car will be essential for independent exploration of the area. Having your own car will give you more flexibility than using public transport options and, in some cases, offer you access to places which are otherwise difficult to visit without the use of a car. Read our guide to Car Rental in Mexico to learn what you need to know about car rental in Mexico and connect to the Mexperience Travel Center to reserve your Rental Car. Travel Tip: If you plan to simply stay-put at one of the resorts in the area, arranging for ground transportation (see Airport Transfers, above) between the airport and your resort will be a better option. During February, in even-numbered years, a boat race takes place as part of the Regatta Marina del Rey (near San Diego, USA) and finishes in Puerto Vallarta. On odd numbered years, the same tournament takes place but starts in Puerto Vallarta and ends in San Diego. The end of the race is marked with parties and festivities at Las Hadas resort in Manzanillo, south of Puerto Vallarta. Easter Week is the busiest time of year in Puerto Vallarta, as many Mexican and foreign families descend upon the town, one of their favorite holiday destinations in Mexico! If you want to travel at Easter – book well in advance. Exchanging Currency: Banks with ATM machines are found throughout the downtown area of Puerto Vallarta. Some hotels also have ATMs installed and you can draw cash from them within your hotel/resort. During business hours, banks in town and the Casas de Cambio will buy traveler’s checks and cash from you as well. For detailed information about exchanging and managing your money, read the Mexperience guide to Money in Mexico. Safety: Puerto Vallarta, Punta de Mita and environs are extremely safe. You’ll see local police dressed up in white “safari type” uniforms; they are trained to provide assistance and directions if you need it as well as security. Pedestrian Care: Take care when crossing the roads on foot in Puerto Vallarta. The local drivers, especially buses, can be a bit on the aggressive side. If you’re traveling with children, take extra care when you are near public roads. We have no specific restaurant recommendations at this time. If you would like to recommend a restaurant you have visited in the area, please contact us. Locally Hosted Parties – Hotels and resorts host their own parties which include dinner, dancing, a show and all drinks for a fixed fee. Ask at your hotel to find out what is happening locally. Nightclub Scene – For lively night life, you’ll need to travel into Puerto Vallarta. Although Puerto Vallarta is not as wild and lively at night as neighboring Mazatlan to the north, it still provides excellent and varied night life for visitors. In fact, nightclubs are a big part of the holiday scene in Puerto Vallarta, and like their Acapulco and Mazatlan counterparts, they don’t stop till the sun comes up! Some night clubs charge an all inclusive cover fee; some a smaller cover and drinks on top. Drinks are served all night—don’t even consider going to a nightclub before 11pm. Nightclubs keep going all morning and most people will start to leave between 5 and 7 am. The nearby town of Puerto Vallarta offers some good places to shop and buy authentic Mexican goods. Don’t expect any big shopping malls, although there are a couple of plazas with big name shops. Instead, look for the smaller, traditional and independent traders that offer unique Mexican arts and crafts. If you’re buying from a shop, remember that you can ask for items to be delivered to your local hotel later in the evening, which will save you carrying them around with you. The Huichol Indians, descendants from the Aztecs and one of the last truly indigenous peoples of Mexico have begun to market their artwork and crafts in Puerto Vallarta. Their people live high up in the Mountains behind the town. Huichol art has two main ‘branches’: yarn paintings and beaded works. The yarn paintings are said to depict visions that the Indians have and always tell a story, which will usually be written on a piece of paper in Huichol and Spanish and attached to the back of the work. Pictures of wolves, snakes, scorpions and deer depict traditional Huichol elements of Huichol lore; other animals have been added due to ‘market demand’. The beaded works are usually wooden shapes which have beads attached to them with wax and represent the shape of an animal. See note above for the animals that represent true Huichol lore.